The Nordhavn line of trawler yachts continues to be one of the few that provides production bluewater passagemakers to pleasure boat owners. While we all recognize the growing number of custom builders creating outstanding expedition and offshore trawler yachts, it is PAE&apos;s Nordhavns that one consistently finds at boat shows around the country. No other production or semiproduction builder can point to a line of bluewater boats that offers a range of sizes to fit most budgets and cruising agendas that involve offshore travel. From my vantage point, I see that most new boats coming into our market are getting larger and larger. So the Nordhavn 43 is especially welcome, as PAE acknowledges interest in smaller, yet still capable, cruising boats. Using the experience and feedback gained from its Nordhavn 40, PAE has incorporated into the N43 ideas about what needs to be in a nextgeneration boat. While the Nordhavn 40 remains an able passagemaker in its own right, its design and layout do not allow the flexibility to change certain features. The Nordhavn 43 does. To recap some of PAE&apos;s evolution, starting with the introduction of the Nordhavn 47 a few years back, PAE has made many significant changes aboard these boats, and the Nordhavn 43 benefits from the effort. These changes reflect PAE&apos;s ideas about what works best-such as an aviation-styled fuel delivery system that uses a supply tank, gravity fed from the main tanks. The electrical system and the plumbing system-complete with a graywater tank-also represent newer construction techniques. Using fewer molds makes for tighter and improved construction, and reduces manufacturing time and costs as well. Decks are Baltek end-grain balsa and plywood core, and all vertical surfaces (such as cabin sides) are sandwiched Klegecell foam core. While the Nordhavn 40 has a full-width saloon, the new N43&apos;s side-deck arrangement is asymmetrical, with a skinny port deck with safety handrail and a normal-width starboard side deck. Fiberglass fuel tanks are now standard, with a total fuel capacity of 1,200 gallons. The two tanks are built with large inspection ports to allow a technician to get inside if that becomes necessary down the road. Another effort I find outstanding is the complete documentation prepared for each boat, with schematics, material lists, and instructions that provide an owner with all the information necessary to sort out the issues and inherent problems one encounters cruising the world. PAE has spent a great deal of effort putting this owner manual and documentation together-which is unique to each boat-and I applaud this complex endeavor. The Nordhavn 43 is also designed with a much larger pilothouse than its smaller sistership, allowing for a full-size helm chair. The new boat has larger maintenance strakes (those blisters near the keel) that allow for better headroom in the engine space. The designers felt that more headroom was worth the downside of the marginal increase in water resistance. Other improvements include a faired bow-thruster tube, larger windows than those on the Nordhavn 40, and a redesigned foredeck with a raised anchor platform. And the knuckle on the 40-footer is gone, as the N43&apos;s hull has a slightly greater flare in the bow area. One might think that PAE would have chosen to have the Nordhavn 43 replace the Nordhavn 40, but interestingly, that didn&apos;t happen-and for good reason. The changes are so significant that the boats are not really comparable, and the base price of the larger N43 is just over $600,000, while the Nordhavn 40 remains closer to $450,000. The price difference alone is enough to separate the two boats. But what did happen-while not expected, but certainly understandable-was that the splashing of the Nordhavn 43 meant the end of the classic Nordhavn 46, the boat that started it all for PAE. The significant edge in every detail makes the new N43 a better engineered and constructed boat than the original Nordhavn. After building 81 N46s, South Coast Marine, the Taiwan builder of the Nordhavn 46, 43, and 50, stopped production of the 46-footer. The Nordhavn 43 has replaced it in the model lineup. Both were designed to be ideal boats for cruising couples. But in 2006, comparing the 43 to the 46 is much like comparing a new Porsche Boxster to a vintage Triumph TR6. Both are great cars for their eras, but the newer Porsche is hugely better in every respect-as is the Nordhavn 43. Boarding the boat will normally be from either port or starboard side cockpit doors. Although this may be a very convenient form of access from a floating dock, getting aboard from a fixed dock may not work out as well. When the fixed dock is high, crew will have to step over a stanchion onto the foredeck, which is 7 feet above the water. The starboard side deck is a bit narrow at 14 inches of usable walking space (due to the stainlesssteel stanchions), but the compromise maximizes interior saloon space. The lack of a normal side deck on the port side was done for the same reason. The curved transom of the aft cockpit incorporates an 18-inch-wide transom door that leads onto a recessed swim platform. The outboard ends of the transom house storage for two 20-lb. LPG tanks on the port side and an Edson bilge pump and storage in the starboard locker. The aft cockpit is mostly covered by the boat deck and has 6 feet 6 inches of headroom. In addition to a washdown shower, engine room vents, and Cantalupi overhead dome lighting, the cockpit has a huge lazarette hatch-measuring 34 inches by 40 inches- that opens into a large lazarette space under the cockpit. Two gas struts hold the large hatch open. Climbing down into the 30-inch-deep lazarette, I found the space begs for a removable set of steps (not a ladder, please) to get into the lazarette. Lots of storage here, along with steering gear, electrical components, clearly labeled through-hulls, a Seaward water heater, an inverter/charger, and emergency master disconnect switches for the house and davit circuits. Lifting the fiberglass access hatches in the lazarette sole reveals the pronounced propeller pocket for the single four-blade, 32-inch prop. Closing the lazarette hatch, I noticed something new-something nice. Instead of cast hatch hardware seen on most boats, with those sharp edges and rough backs, the builder replaced them with smooth-surfaced, lighter, and higher quality hardware. Nice touch. Diesel fuel fills are located in the steps just off the cockpit. Forward on the starboard side deck, on the aft end of the Portuguese bridge, are two 30-amp shorepower inlets and a television/telephone inlet recessed in the bulwark edge of the pilothouse. This means shorepower service is convenient whether the vessel is tied bow in or stern to, and also eliminates the need for duplicate shorepower inlets at both ends of the boat. The tall stanchions on the starboard side deck are 33 inches high, and they feel secure, but I found the side deck way too tight for my frame, especially as the eyebrow of the boat deck structure intrudes into the space by several inches. Farther forward, the bulwarks around the pilothouse are 36 inches high and give that little-ship protection we&apos;ve come to expect from PAE. The decks around the Portuguese bridge average 18 inches wide and allow comfortable transit around the pilothouse and up to the foredeck, which extends 10 feet forward of the bridge. The molded nonskid here is typical of the Nordhavn line, as are molded-in deck hatches, dorade vents into the living spaces, and hefty anchoring gear, which includes a Maxwell 3500 vertical windlass. One boat I was on sported a 110-lb. Bruce anchor on the bow. An 18-inch, round, watertight Freeman hatch leads into the chain locker. Double bow rollers are standard, and the combined stanchions and bulwarks offer over 37 inches of protection around the foredeck. The Nordhavn foredeck is all business. Climbing five steps from the Portuguese bridge on the port side gets us to the boat deck and access to the optional flybridge. The flybridge is somewhat of a minimalist control location, complete but not overly so. That is not surprising, as any Nordhavn fan is a pilothouse lover as well. Flybridges are fine in pleasant weather, but for serious offshore work, the pilothouse is king. And the flybridge on this boat is not intended to be the social center one finds on boats that are more oriented toward coastal cruising. Double doors in the flybridge helm console open into a huge, empty storage space inside the flybridge. It is an enormous space, good enough for cushions, refugees, folding bikes, and extra sleeping accommodations in fine weather. I bet PAE could host a great contest to see what creative uses owners come up with for this cavern. The boat deck on the N43 measures 11 feet wide by 12 feet long, and most of it is usable for kayaks, dinghies, bikes. One boat I was on had a dinghy crane with the optional fiberglass dry stack, instead of the standard Forespar mast and boom. But as we preach so often, less is more, and this boat screams to be left alone without the motorcycle, jet ski, and jumbo RIB nestled side by side on the deck. But let&apos;s revisit that later. Step through the cockpit door and you&apos;re in a saloon/galley arrangement quite familiar to Nordhavn enthusiasts-an L-shaped settee with adjustable table to starboard, the longer side of which can be a sea berth. At 6 foot 2 inches, I found I could stretch out OK, but the curved cushion at the apex of the L-shape would cramp my neck for sure. Removing the cushion was a quick remedy. The saloon measures a mere 5 feet 4 inches in length on the port side, so I would opt to replace the standard built-in settee for a freestanding chair-a more comfortable and livable solution for sure. I&apos;ll gladly trade some storage for comfort, and besides, this boat has lots of storage space already. The vintage days of uncomfortable bench seating with storage underneath are over for the most part. And today&apos;s trawler folks don&apos;t rely on cases of Dinty Moore beef stew tucked under a settee any more than Joshua Slocum carried an EPIRB in addition to his tacks for safety at sea. Large, half-inch-thick glass windows surround the saloon. The side windows open and have integral screens, so the ventilation in this boat may eliminate the continuous use of air conditioning. And the Dutch cockpit door adds to the boat&apos;s ventilation equation, as it can be left open on rainy days when the boat is anchored off some tropical island. I did notice the top half of the opening windows-which slide down to open-seems a bit heavy for less athletic types, especially when reaching it requires stretching across a cushion. But as this boat can go to sea, normal sliding windows are not really up to the job. The teak-paneled interior has lots of recessed Cantalupi lights that work well, and multiple reading lights are placed strategically for use by off-watch crew. The sole in the pilothouse, saloon, and staterooms is teak and spruce. A top-loading Sub-Zero freezer is just forward of the L-shaped settee and table, with the daily-use freezer (or refrigerator, your choice) across the way on the galley side of the cabin. The U-shaped galley features granite countertops, deep double sinks, a three-burner LPG stove and oven, an under-thecounter fridge, and a microwave. A trash compactor is also standard. The lockers and drawers around the galley all have positive locking hardware. The counter is 37 inches high off the sole. Moving forward, up three steps and we&apos;re in the pilothouse, a much larger command center than found on the Nordhavn 40-or the Nordhavn 46, for that matter. It features a watch berth and settee and table behind the helm. And there is now room to mount a fixed helm chair, such as those lovely Stidd or Crown chairs you see in the pages of PMM. Headroom in the pilothouse exceeds 6 feet 6 inches. In the pilothouse, as well as other areas of the boat, it is great to see PAE finally leave off those tall, circulation-restricting, wrist-numbing fiddles that once were commonplace on Nordhavns and most other trawlers. A decided holdover from sailing days, I&apos;ve questioned their utility for years, as they are painfully unnecessary on most furniture surfaces on stabilized vessels. Subdued fiddles should be used where they make sense, and nowhere else. Forward and side visibility from the helm is outstanding, another reason why a flybridge is not essential on a boat of this nature. Why be outside with all this good stuff going on in the pilothouse? There is a chart table on the port side of the helm. I opened the cabinet below this table, fully expecting to find a set of chart drawers.... Instead, I found the boat&apos;s optional washer/dryer combo. Heck, on those long night watches, why not do laundry? That thought seemed silly at first, but big appliances such as this Italian Splendide 2100 unit take up space, and it takes creativity to get them aboard. Who knows, maybe PAE will change traditional watch schedules from hours to dryer cycles. Unfortunately, the small table behind the helm doesn&apos;t open into a serviceable folding table, although I could easily imagine that modification. Oh, and I did find a large chart drawer under the settee, with lots of space for other tools of navigation and safety equipment. The two Dutch pilothouse doors open for ventilation, as do two forward windows. As elsewhere on the boat, the Cantalupi overhead lighting provides balanced, useful light. The helm console offers more than enough real estate for a full marine electronics suite, and more. Unfortunately, that is the trap, as many of us install way more electronics than are "necessary" for safe passages. And that brings up a point I kept thinking about as I toured this new Nordhavn. I continue to struggle with the concept of an affordable passagemaker (yes, Project X is still alive)- a boat that is able to cross oceans in safety, but that doesn&apos;t break the bank. These days, boats are exceedingly expensive, and the trend toward larger boats pushes the bottom line even further out of most people&apos;s range. 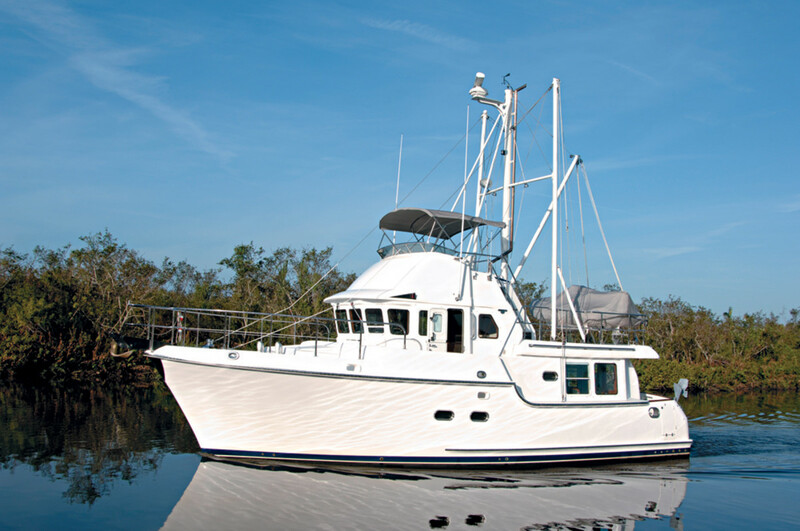 A boat like the Nordhavn 43 brings it closer for many. But experience shows it is difficult to refrain from buying everything on the long option list, adding a seemingly unending assortment of equipment and "stuff " folks think they need. Several hundred thousand dollars later, the boat is still at the docks, with technicians scrambling to find the space to put it all. Is it possible to take a competent smaller boat, such as this Nordhavn 43 (smaller is relative, of course, as a 55,000-lb. displacement trawler is no pocket cruiser), and leave off all the stuff? Keep the anchoring gear first rate, put money into communications, but not into every technology that exists. Can we live with a boat that does not have multiple chilled-water air conditioners, redundant freezers, and over-the-top electronics? Equipment can&apos;t break if it is not on the boat, and maybe a simpler approach would make the dream possible for more people. I&apos;m not suggesting that one should equip a new boat with kerosene lanterns, but for successful cruising and voyaging, does one really require most of the equipment that finds its way aboard these boats? It is an uneasy question, as I am very familiar with boats that get top-heavy from the weight of the gear and equipment owners feel they must have to live out the dream. As a result the boat gets mentally smaller- and way more complicated-and the joy of simplicity turns out to be anything but. This is obviously not Nordhavn specific, although PAE&apos;s Dan Streech and Jim Leishman have had this discussion with me from time to time. But it is a common thread that happens over and over on all brands of trawlers. So as I spent time aboard the Nordhavn 43, I asked myself if it had to be so. The standard, basic boat already has the potential to do more than most care to pursue, and it&apos;s already well equipped. So why do I need to load it down with a plasma television, a hot tub, and granite flooring? That seems to be one key to an affordable and maintainable passagemaker: Keep your eyes away from the options list. Just leave the boat alone. The reality is that, for a new vessel, one needs a boat at least this long to go to sea, and the boat will need a strong diesel engine, large fuel capacity for range, with a quality fuel-management system, some form of stabilization for comfort, two comfortable cabins, great anchoring gear, a galley that works at sea, and a competently equipped helm. Add all this up and the Nordhavn 43 seems to meet these requirements. Go through the standard production boat and there just isn&apos;t much fluff. I&apos;m told by the folks at Nordhavn Southeast that replacing the teak and spruce sole with sea grass carpets really won&apos;t make much of a difference in the cost of the boat, nor would replacing a pressure water system with hand pumps. In the scheme of things, those details are negligible. A relaxed set of steps leads down from the pilothouse to the forward accommodations. The 43- footer has two staterooms, with the guest stateroom in the bow and the master stateroom amidships. The guest cabin has a double bunk outboard on the port side, with desk and hanging locker opposite. Lockers, drawers, and shelves are spread throughout the cabin&apos;s usable nooks and crannies, taking advantage of the available space. Sole hatches provide access to the thruster battery and water tanks. The en-suite head is forward of the guest cabin, with the shower in the bow area, just behind the chain locker/collision bulkhead. Unlike in larger boats, there is no space for an overhead hatch in the shower. It would be a welcome accessory when anchored in paradise, but leaving it off is one of the compromises of a smaller boat with this potential. The master stateroom is in the belly of the boat, just under the pilothouse, and features a queen-size island berth athwartships, with hanging lockers and drawers on both sides, and drawers under the berth. There are several opening ports and decent storage space for clothes and personal gear. The master head is across from the island berth, on the starboard side, with a sliding pocket door that truly opens up the head to the rest of the stateroom. A full standing-headroom shower integrates well with the rest of the head area. The shower&apos;s hinged seat lifts to reveal the starboard fin stabilizer actuator. I&apos;m not sure how to solve my next observation. I know space is at a premium, but where can a woman sit down to do her daily routine-hair, makeup, the works? The marine toilet faces the wrong way and is too far forward to provide seating by the vanity. And even if the toilet seat would work for that purpose, the vanity&apos;s mirrored doors would not be low enough anyway (the bottom edge is 52 inches to the sole). Perhaps the forward side of the island berth could be tweaked to accommodate a woman&apos;s vanity table, or whatever it&apos;s called, using the berth as a seat. There is already a mirror and 110VAC outlet, so a small desk with drawers might be possible. It is something to figure out, for sure, as all the women I know would expect such creature comforts in a boat of this genre. I spoke with Pete Eunson, PAE&apos;s project manager for the Nordhavn 43, and he told me that although no one has yet requested this feature, it could be done with a bit of design work from Jeff Leishman, head designer of the Nordhavns. I was surprised to find the locker interiors behind the mirrored doors are unfinished fiberglass strands and mat. Someone must have skipped this step during construction, as I didn&apos;t see this anywhere else on the boat. Finishing off these lockers would seem imperative from the feminine perspective. Another observation is that the port stabilizer actuator is maybe 28 inches from the pillow of someone sleeping in the master berth, and it is not as insulated as it could be, although adding sounddeadening material would be an easy fix. I would also suggest storing sweaters in the drawers next to the berth, as they would absorb some of the sounds of the stabilizer working its magic. However, the boat&apos;s overall size puts it squarely in the game for a paravane flopperstopper system, able to be handled by a couple. On a small boat, this may be a simple, reliable solution for a boat going to sea, trading the push-button convenience of an active fin stabilizer system for a mechanical system outside the boat. I also noticed a conspicuous lack of handholds in both staterooms, although Pete Eunson explained they are intentionally left off the standard boat, but they are optional. It seems PAE&apos;s experience is that every owner has different ideas on the number and placement of handholds-each couple has different heights and needs. In any case, that would be first on my short list of options, as tracking past the foot of the berth to the engine room access door (on the aft bulkhead of the master stateroom) would be dicey in rough seas when the stabilizers aren&apos;t working. 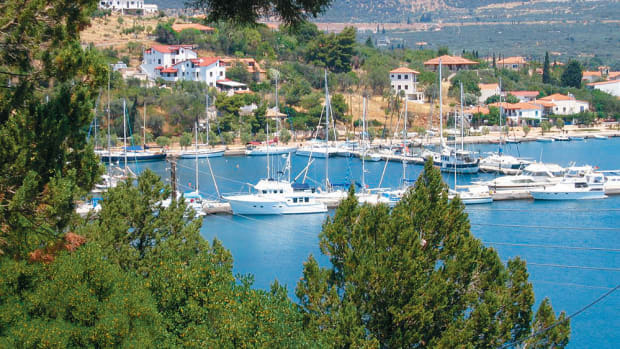 It is important to note that all of these points are not particularly relevant for the majority of cruising boats out there, which are comfortably berthed by the cocktail hour. But this boat is capable of so much more, so they are worth pointing out. It is a caveat of voyaging in small boats. The balance of boat design, equipment, and ergonomics is a real challenge when the boat is small. And, recalling a conversation I had with designer Ed Monk, anything smaller than 80 feet can be considered a small boat-at sea. The full-size dogged door on the master stateroom&apos;s aft bulkhead provides easy access into the engine room. But the illusion of "easy" access is soon dashed as one tries to step into the space. For no apparent reason that I could fathom, one must step down a full 16 inches to the step just inside the door, and this vertical movement is indeed awkward with creaky knees. Were it not for a sturdy stainlesssteel handhold that allowed me to gently lower myself down to the step, I would have had to sit down to get inside. I just don&apos;t get this at all, as the step is also a lift-up cover for the gravity-fed fuel delivery system and could easily be made 8 inches higher to make access more ergonomically acceptable. Headroom in the main body of the engine room is 62 inches. While the single Lugger L668D diesel, coupled to a ZF W 220 transmission, commands center stage, it was the fuel manifolding and filters that caught my eye as a close second. Big letters on a colored background make it easy to see what is going on. The Lugger is keel cooled using a Fernstrum Gridcooler, with a stainless-steel dry exhaust, both of which contribute to trouble-free cooling and exhaust systems. The boat comes standard with both 140-amp and 90-amp alternators. Tier II emission standards went into effect in January 2006, and this engine will no longer be available from Northern Lights because it does not meet these new emissions requirements. When the yard&apos;s stock of L668 engines is exhausted, the builder will replace the 105hp L668D with a Lugger LP 1066T, rated at 165 continuous horsepower. A couple of years ago, I was thrilled to see the engine and genset master battery switches on the Nordhavn 47 moved out of the engine room and into the lazarette. Unfortunately, on the Nordhavn 43 they are back in the engine room, a bad place for them in case of an engine room fire. These switches need to be moved out of the engine room, so that the electrical system can be de-energized from the safety of somewhere other than the location of the fire and its lethal toxic fumes. Although this arrangement is not in violation of current ABYC standards, I&apos;ve mentioned it many times before. There are such compelling reasons to move them out of the engine room, I can&apos;t imagine that it won&apos;t become an ABYC mandate in the future. You wouldn&apos;t mount a handheld fire extinguisher behind a stove, would you? The interesting fuel delivery system brings fuel from the low point of each tank, and gravity feeds the fuel into a central aluminum 40-gallon fuel reservoir, which then supplies fuel to the engine, genset, and wing engine. All return lines from the main engine, genset, and wing engine come back to this reservoir. A water sensor in the common tank warns of water in the fuel, and a petcock at the bottom of the 40-gallon tank drains off water and any accumulated debris. And connecting all of the fuel system components are an excellent threequarter- inch Aeroquip fuel hose and swaged brass fittings. This blue hose is the best and safest way to transfer fuel (it is fire rated), and is hands down better than copper tubing for a bunch of reasons. The impressive fuel transfer manifold and Racor filters, mated to a Walboro fuel pump and timer, allow both fuel transfer and fuel polishing. This would normally be done when the boat is at rest, so the fact that the timer is at the far end of the space isn&apos;t that big a deal, although I would prefer it to be on the end closer to the dogged door for better access. As it is, the engine room space is tight, and there is little to hold onto when moving around the engine room. Spending time in the engine room to shoot photos, I kept catching my shirt on a valve, hitting my head on a light or blower, or making contact with a wire terminal on the back of an alternator. And this was at the dock. Which brings up a point that may spark a debate. Several years ago, PAE decided to clean up the Nordhavn engine room space by putting all the bits and pieces of an engine room and its machinery behind bulkheads and soundproofing shields. While this approach is similar to a modern car mentality- with a clean and sanitized engine space-it clearly robs valuable interior space. That may not be a big deal on a larger boat, but it is very noticeable on the Nordhavn 43. 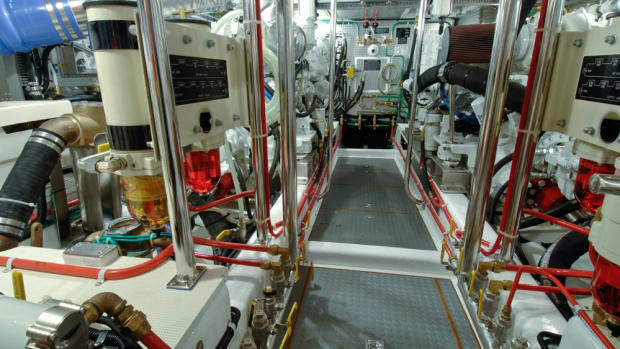 Without the fiberglass/wood structure covering hoses and wiring surrounding the perimeter of the engine room, the open space would be increased, and perhaps allow more space for the optional safety grab bars around the engine that would help one stay clear of a running diesel. I mentioned this to Pete Eunson, who said this clean look is a major reason why the boat is selling so well, although he did agree the structure in question simply hides hoses and valves at the bottom of the fuel tanks. Regardless, it is a bit tight for my tastes, so accepting that it is a smaller boat, I would do everything I could to increase the available space. And as far as the clean look, from a gearhead perspective, this is like taking an exquisite piece of machinery, like an Italian Ducati motorcycle or Harley Davidson, and covering it up with a fairing. I like my machinery and all its parts out in the open to see, touch, smell...and maintain. An exposed engine room can be downright beautiful. If that translates into a slightly louder boat, I would accept that tradeoff, as the boat is darned quiet under way. In fact, I measured 67dBA in the pilothouse at 1800 rpm and 7.2 knots. I walked around the boat and measured 68dBA in the saloon, 67dBA in the master stateroom, and 62dBA in the guest stateroom. Speaking of under way, this passagemaker is amazingly agile, and an experienced skipper can really make it dance. Nordhavn Southeast&apos;s Dennis Lawrence moved the boat around with remarkable grace, and I was impressed by how easy this boat is to handle. And with a range over 3,300nm, this boat has the potential to accomplish adventures beyond the scope of most trawlers. The Great Circle Route? No problem. Summers in Alaska or across to Newfoundland? Not an issue. World cruising or gunkholing the Med? Very well, and a comfortable liveaboard through it all. PAE keeps most of its focus on building bluewater boats, but in recent years, it has also recognized that many of its fleet are used for general cruising as well-owners living the dream without necessarily crossing oceans. Owning a boat capable of going to Tahiti does have a certain fascination, whether you go there or not. The new Nordhavn 43 is just such a boat. And its size makes it a joy to handle in all respects. Small makes it big in my book. In fact, I believe the boat is well positioned to become a popular cruising boat for a diverse set of cruising plans. By keeping a tight rein on the gear that goes aboard, it may, in fact, get us closer to the reality of an affordable passagemaker. At least, that would be my goal.